It was clear to me that the name “Disk Maestro” had to change. 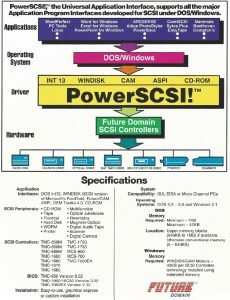 At the COMDEX computer show in 1992 we introduced “PowerSCSI” as a replacement for Disk Maestro. Along with our own software, we included software from several third party companies who wished to bundle with our product. The manual for PowerSCSI was 52 pages long, giving the sense of its capabilities. One sore point in the software package that remained from Al Pease’s tenure was the lack of an ASPI driver. Future Domain worked with many other companies to develop a standard way for third party software to interface to our host adapters called CAM (Common Access Method). The goal was to develop an industry (ANSI) standard. In 1990 Adaptec decided to release their own standard interface, ASPI. ASPI became popular for Windows and DOS but we only had a CAM driver. I asked Al to develop an ASPI driver software but he said it could not be done without losing CAM compatibility. One of the first things I had Mehran do after I put him in charge of Software development was develop an ASPI interface and his people did it in a clever way. They simply developed an ASPI to CAM translation module and passed all ASPI requests to our proven industry standard CAM driver. This way we maintained both ASPI and CAM compatibility. Once the ASPI module was developed we were ready to relaunch the Disk Maestro as PowerSCSI. Another major change to the software package was much stronger support for CD-ROM. In addition to utilities we developed, we included third party software to handle picture and video CD’s, music CD’s, and later the first CD-writer software.